Unlike those other three bars, I had U-No as a kid. And I remember liking it. So today weâ€™ll see if Iâ€™m transported back to those halcyon days of rare treats, or caught in a transporter with a fly, like Jeff Goldblum, with disastrous consequences. And really, Iâ€™m a little worried, because my childhood taste was far from infallible. Two things I didnâ€™t realize growing up: U-Noâ€™s have powdered buttermilk and crushed almonds in them. That might have freaked me out at 8, but it intrigues me now. So, will I still like this unique candy in the lunar-module, super-shiny wrapper? Hey everybody, Look! 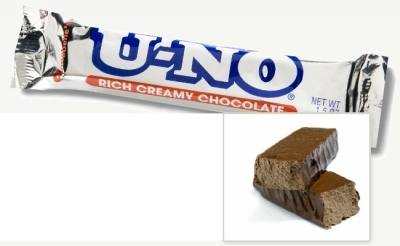 Itâ€™s the second candy bar in my four-bar round-up of some oddly named candy that includes Oh Henry!, 5th Avenue, and U-No. 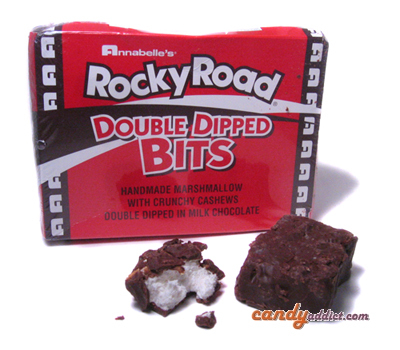 Annabelle candy bars are best-sellers in western states, and include the Rocky Road, Big Hunk, Abba-Zabba and U-No bars. 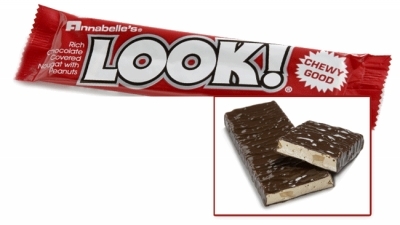 Todayâ€™s item, Look!, was invented in the 1950â€™s by the Golden Nugget Candy Co., which Annabelle acquired in 1972. I doubt youâ€™ve ever had a candy bar quite like this. And there may be a good reason. One of the new candies unveiled at this year’s All Candy Expo was this new twist on a classic candy: the Abba-Zaba Chocolate Cream center. When Brian told me about his find on the showroom floor I couldn’t help but respond by asking a gazillion questions about it. For me, a new addition to the Abba-Zaba family was big, big news. The original Abba-Zaba is a sweet taffy with a stripe of peanut butter running down the center. There’s also a Sour Apple variety with the taffy carrying the flavor and the peanut butter center remaining intact. What I found most exciting about this new Abba-Zaba was the replacement of the peanut butter with “chocolate cream” (ok, so it’s really mockolate), which sort of takes away the consistent component of the candy. I was curious to see if this hurt the formula of the bar at all. “They’re here, they’re finally here!” my tummy yelled when a box of Annabelle’s new Rocky Road Supreme bars found their way to my doorstep. 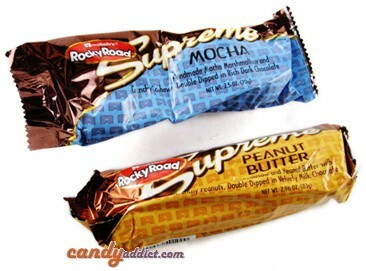 I had luckily sampled these at last year’s All Candy Expo when they were still just prototypes. Regardless of the fact that they weren’t finished tweaking the formula, I knew what I was eating was extremely tasty, so I patiently waited until they would be ready to be consumed by the masses.